I use a SILPAT to line my baking sheet, but you can use parchment if you like. Mix together bread crumbs, parmesan cheese and parsley and black pepper. 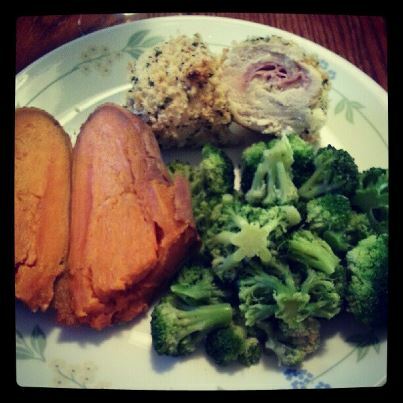 Take each chicken breast and lay down 1/2 a slice of cheese, 2 slices of ham and the other 1/2 slice of cheese. 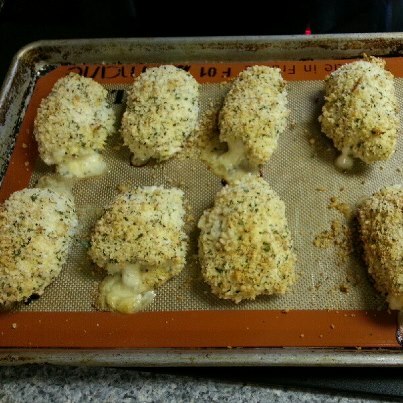 Take each rolled up chicken breast and dip in egg beaters, and then into the bread crumb mixture to coat evenly. Repeat with each one till done. **when you remove it from oven, let it sit for a few minutes to let the juices settle and the cheese to set back up again. If you skip this and cut right into it the juices and cheese will just run right out.